Power-Zymes®, 90 vegetable capsule (Bluebonnet) - Penn Herb Co. Ltd.
Bluebonnet’s Power-Zymes® Capsules contain enzymes to help break down a diet high in protein with some carbohydrate and fats. Plus, each capsule contains ginger and peppermint to soothe digestive function. AMOUNT PER SERVING (1 CAPSULE): Betaine HCI 100 mg; Ox Bile Extract 100 mg; Pancreatin NF10X 70 mg; Papain (2.5 mil FCC PU) 50 mg; Ginger Root Extract 50 mg; Peppermint Leaf Powder 50 mg; Lipase (1686 FIP) 34 mg; Bromelain (512,000 FCC PU) 17 mg; CereCalase® (200 MU) 10 mg; Amylase (521 DU) 5.2 mg; Pepsin (1:10,000) 4 mg. OTHER INGREDIENTS: Kosher vegetable capsules, Rice bran, Silica. Contains: Sulfites (papaya). Free of milk, egg, fish, crustacean shellfish, tree nuts, peanuts, wheat and soybeans. Also free of yeast, gluten, barley, sodium and sugar. 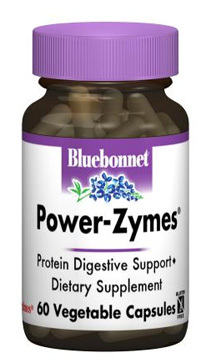 Helps break down protein with some carbohydrate and fats; soothes digestive function. As a dietary supplement, take 1 capsule daily preferably with a meal or as directed by a healthcare practitioner. CAUTION: Do not use in cases of stomach pain or ulcers.